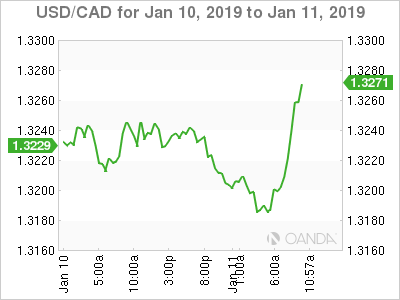 It’s been an excellent week for the Canadian dollar, and the currency has posted slight gains on Friday. In the North American session, the pair is trading at 1.3215, down 0.16% on the day. On the release front, there are no Canadian events. Investors are bracing for weak inflation numbers out of the United States. CPI is expected to drop to -0.1%, while Core CPI is forecast to remain steady at 0.1%. The Federal Reserve is sounding much more dovish of late, after a hawkish rate statement in December sent equity markets plunging in late December. The minutes from that meeting noted that low inflation levels meant that the Fed could “afford to be patient about further policy firming.” Even more striking, the minutes revealed that at the December meeting, some policy-makers opposed a rate hike, arguing that inflation was too low to warrant higher rates. The U.S. dollar responded to the minutes with broad losses on Wednesday. On Thursday, Fed Chair Jerome Powell said he was “very worried” about the massive U.S. debt and reiterated that the Fed would remain patient on monetary policy. Given that further interest rate hikes would hurt the debt burden of corporate borrowers, Powell’s remarks on the debt could be a sign that the Fed will take a pause on rate hikes in the near future, and perhaps even entertain a rate cut this year. The Bank of Canada held the benchmark rate at 1.75% on Wednesday, which is unchanged since October. The bank policy statement was somewhat on the dovish side, as policy-makers highlighted their concerns for the economy. These included low oil prices, an overpriced housing market and the global trade war. The Canadian economy is highly dependent on exports, and a weaker global economy has put a crimp in the export sector. The Canadian dollar had a dismal 2018, falling 8.4%. However, it’s been a stellar January for the currency, which has jumped 3.0%, recovering the losses seen in December. The loonie is sensitive to the movement in equity markets, and higher risk appetite has boosted the currency. The BoC remains cautious, and is likely to hold off on interest rate hikes until the current turmoil in the equity markets eases.